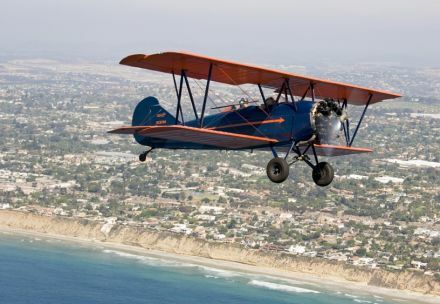 I once shared a hangar with this beautiful 1929 Travel Air. About 20 years ago I learned to fly at the New Garden Airport in southeastern PA. Shortly after getting my license, I purchased a 1961 Piper Colt. Not long after I purchased it, this amazing aircraft showed up in the adjacent hangar. 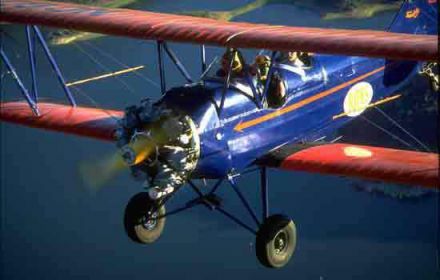 The plane had been purchased by a young lady who quit a secure job and started a barnstorming business with a business partner giving rides in an open cockpit biplane. I was amazed to think that someone would leave a secure job and start a business like that. Later on when I was exposed to Richard Bach’s books I felt like his stories might have inspired the couple to throw caution to the wind and start that business. While reading the Slashdot feed yesterday I saw a reference to a site that was exposing the Internet get-rich-quick schemes that are so prevalent these days. The article referenced a website called undress4success.com. Despite the attention-getting title, I learned that it was dedicated to providing useful information to people who are working from home. It provides resources to help people who like the idea of a 2-second commute and the site’s owners regularly gave the low-down on scams that prey on those hoping to make a living working from home. The most recent article was related to the ‘Work for Google’ scams that are being actively pursued by Google’s legal team, since they are not endorsed or supported by Google. The scammers are just trying to profiteer from pretending to have an association with the Internet search giant. I like to expose scammers. Seeing unscrupulous charlatans abuse the goodwill and trust of others is just one of those behaviors that I can’t sit by and idly watch. Several of my most popular blog articles are related to exposing scams like the Amish Heat Surge miracle heater, the Arctic Cool Surge (yes, same company), and exposing the unworkable mathematics of all MLM schemes. I was reading through the website and I started to realize that the couple running it had a very familiar-sounding story. They mentioned that they had started a Barnstorming business in Pennsylvania in the early 1990’s, moved it to San Diego, and then grew it to 7 aircraft and 25 pilots before selling it and starting this new website and promoting their book entitled Undress for Success: The Naked Truth about Making Money at Home which is about how to work from home. It was Kate and Tom, the same couple I had met at New Garden Airport, all these years later! It’s certainly a very small world. I had been working on my own article about people who make money by selling others on the idea of how to make money on the Internet. The funny thing is that many of these sites are all writing about the same thing, which usually involves selling ‘secrets’ or starting an endless cycle of recruitment for information products. It sounds a lot like an abusive MLM business. The kingpins in the worst MLMs don’t actually make their money selling products, they make their money selling high-margin ‘educational materials’ and ‘tools’ to unsuspecting recruits month after month. This is precisely what these get rich quick membership sites (who generally want a direct line to make a monthly withdrawal from your bank account) are up to. When it’s all said and done, they sell you on a business that is nothing more than a recursive cycle for you to try to write and sell the same kind of information on the Internet. But who wants to buy from you when they can go right to the source, i.e., the guy holding up an image of his big earnings check on every one of his pages? They augment this income with a other questionable affiliates all who have something to sell you that sounds like it will teach you to get rich quick. Or, if not that, then information on how to get flat abs, or get ripped like Arnold Schwartzeneggar in 4 weeks. I just purchased the book based on the positive reviews I’ve read on Amazon. Websites that educate people on the perils of scams tend to restore my faith in humanity and I always feel good when I come across one. Remember, if something sounds too good to be true, it probably is, and on the Internet, that goes double. This entry was posted in aviation, business, entrepreneur and tagged blogging, business models, scam by Lee Devlin. Bookmark the permalink.